It’s an absolutely gorgeous Saturday here in Old Town Alexandria! And as it’s Saturday, it’s time for another Studio Selfie. 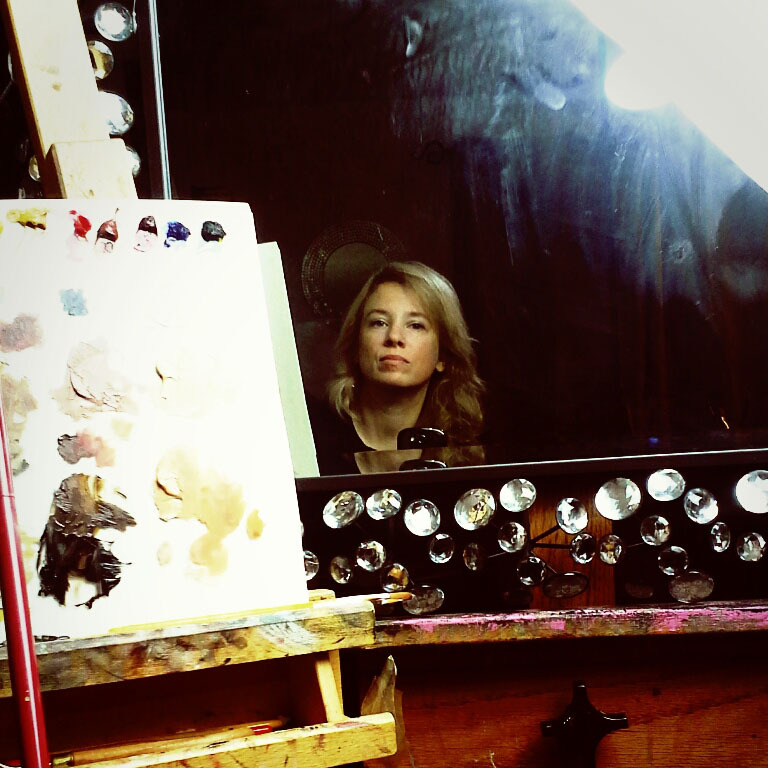 Today’s #StudioSelfieSaturday post features Illinois artist Lisa Gloria. A self-taught painter as well as a writer, musician, gardener, and mother of four, Lisa aspires to bring modern drama and aesthetics to her paintings of figures and still lifes. You can check out her available work here, but be sure to keep an eye out, as we’ll be getting new work soon–Lisa will be participating in September’s “Pay It Forward” show, where 10% of sales will be donated to one of five selected charities! We’ll be sharing more info about Pay It Forward in the coming weeks, so be sure to follow our social media pages on Facebook, Twitter, Instagram, and Pinterest to keep up on the latest news! Cats/Dogs? ONE BLACK CAT, HELLBOY. Your first car: 1992 VW JETTA FIVE-SPEED. MAN. I LOVED THAT CAR. If you could time travel and witness an artist create their masterpiece, which work would you choose? HMMMMM. I THINK I WOULD LIKE TO HANG OUT WITH WATERHOUSE. THAYER WAS APPARENTLY ALLERGIC TO INDOOR HEATING, SO WATERHOUSE WOULD BE MORE HOSPITABLE. I WOULD LOVE TO WATCH HIM BALANCE THE COMPOSITION OF “EULALIA.” BEAUTIFUL. All time favorite movie: FIGHT CLUB. Place you’d love to travel to: ALL THE PLACES! EAT ALL THE FOODS! Morning person or night owl? YES. DEFINITELY. If I weren’t an artist, I think I’d be A WRITER? A HOMELESS WRITER? NO. A MERMAID. DEFINITELY.